Cien y Pico is our call to arms and means a [hundred & something] in La Mancha, the land of Don Quixote. Our vineyards are on the wide, dry plateau of the southern Castilian meseta, between the Mediterranean and Madrid, one thousand metres above sea level and surrounded by mountains that offer just enough protection from the icy winters that turn directly into warm summers. Our ancient plantings of [Garnacha] Tintorera thrive in the organically poor but limestone rich, red, sandy Miocene era sedimentary clay between the rocky limestone outcrops that cover the vineyards. Ancient and gnarled, the free standing bush vines, grown on their own roots with just 300mm of rain a year, yield tiny but intense crops. Cien y Pico is nicknamed ‘Doble Pasta’ referring to its deep colour that occurs naturally with the variety [Garnacha] Tintorera. The aim of Cien Y Pico is to protect and preserve these 19th Century vineyards for future generations. 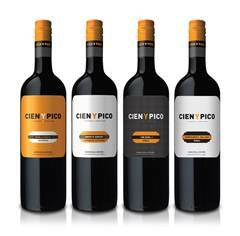 We trust Cien y Pico’s vineyards to produce wines that will allow us, four winemakers-errant, to be victorious in the battle for vineyards of terroir and biodiversity.